Most North Americans have never seen an electric bus. Admittedly, momentum is building—some jurisdictions, notably California, have committed to buying only electric transit buses after 2029. But such buses remain rare in Canada and the United States. A 2018 report found that just 0.2% of US buses (two in a thousand) were electric, and that tiny percentage is rising very slowly. New York City provides an example of the modest pace of e-bus adoption—a three-year pilot project, adding just 10 electric buses to its fleet of 5,700. How’s this for a contrast? Shenzhen China has 16,000 electric buses—100% of its fleet. And that city is not unusual in China. Overall, that country has more than 400,000 electric buses, and is adding 100,000 more each year, with numbers projected to reach one million by 2023. The graph above shows that electric buses can cut greenhouse gas (GHG) emissions by 60 percent (1,078 grams CO2 equivalent per mile for electric vs. 2,680 grams for diesel). 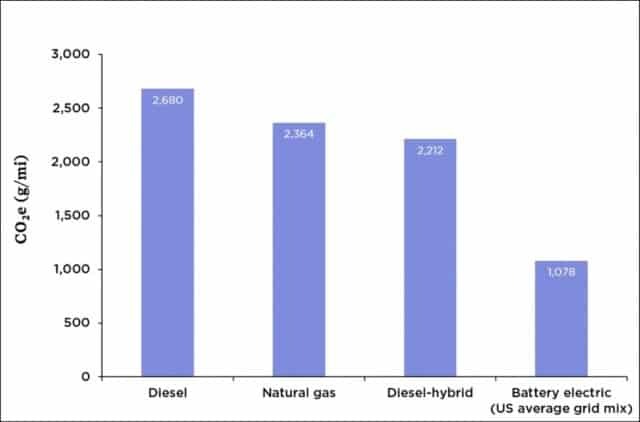 These low emission values for e-buses take into account that much of North American electricity is generated by burning coal or natural gas. If we assume a future in which most of our electricity can come from cleaner solar and wind sources then e-buses can reduce emissions by 85 percent compared to diesel. In addition to having most of the planet’s low-emission buses, China is also leading the world in electric car production and sales. In 2017, China produced more than half the world’s output of electric cars. Chinese motorists purchased 580,000 EVs in 2017 while Americans purchased about 200,000 and Canadians 15,000. Admittedly, many of those Chinese autos are small (think Smart Cars, not Teslas), but that is rapidly changing as Chinese cars become larger and more luxurious. Indeed, their more modest size can be seen as part of the solution, as the production of small EVs creates lower emissions than the production of large ones. Finally, and this is well known, China dominates the world in solar-panel production and solar-power generation, with production and installation rates several times those in the Americas or EU. Moreover, China is not the only country shaming us in terms of clean energy adoption: India installed more solar power capacity than the US in 2017 and again in 2018, and far more than Canada. 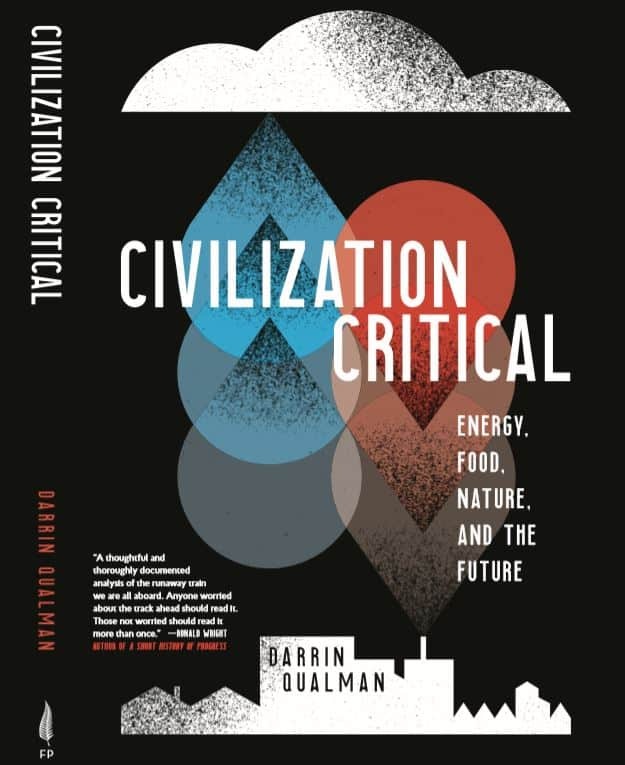 The four examples above illustrate something important about the current climate crisis: solutions are thick on the ground, but we in North America are simply choosing not to adopt them. China has made itself the world’s largest solar panel manufacturer; the US has doubled-down on coal, and Canada continues to pin its economic fortunes on the carbon-fuel sector. China is the world’s largest EV producer; in Canada and the US the best-selling vehicle is the Ford F-150. China has built tens-of-thousands of kms of passenger-rail track; North Americans have doubled air travel. We’re walking past mature and promising technologies—choosing to ignore them. Granted, China has a larger population, but we in North America are far richer. The combined size of the Canadian and US economies is double that of China’s economy. Canadian per-capita GDP is five times higher than that of China, and US per-capita GDP is seven times higher. For every dollar the average Chinese person has to spend on an electric car or solar panels, Canadians and Americans have five to seven dollars. Moreover, we’re not dependent on foreign technologies or companies. 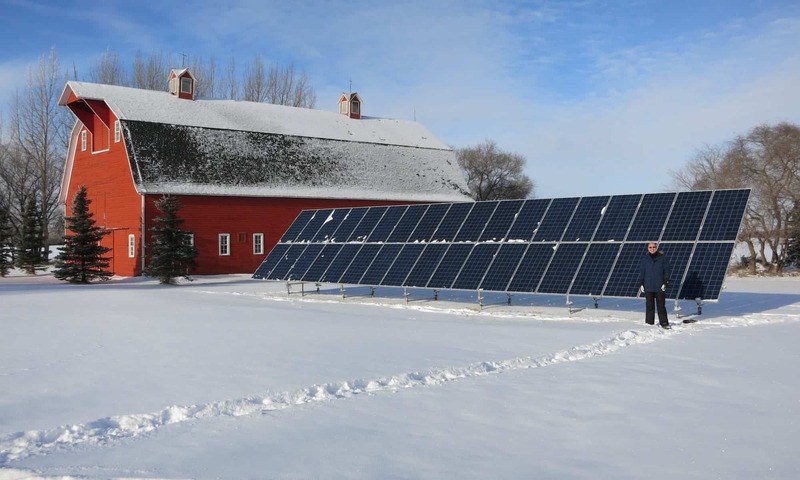 Canadian Solar, headquartered in Guelph, is one of the six largest solar panel companies in the world. Bombardier, headquartered in Montreal, is one of the three largest producers of high-speed rail equipment in the world—supplying China with locomotives and rolling stock. And New Flyer Bus Company, headquartered in Winnipeg, has delivered electric buses to several US and Canadian cities. We’re not short of high-tech corporations—many world-leading technology companies are headquartered in Canada and the US. We’re not without technological options. And we’re not short of funds. We have extremely promising options and opportunities. We’re not doomed. But we are reckless, indulgent, short-sighted, and despicably immoral. And by continuing to act in the ways we are we will probably manage to doom ourselves. But that need not be the case. Solutions abound. Let’s not dwell on the negative. Instead, let’s acknowledge the tremendous upside potential and technological possibilities. Solar panels and electric trains, buses, and cars are solutions close at hand. Within a decade, North America could host tens-of-thousands of kms of new passenger rail track, hundreds-of-thousands of electric buses, tens-of-millions of electric vehicles, and billions of new solar panels. This wouldn’t be a complete solution to the climate crisis, but it would be a very good start. In 1985 I bought an Apple Macintosh computer. It cost $3,500 ($7,000 in today’s dollars). Soon after, Apple and other companies started selling external hard-disk drives for the Mac. They, too, were expensive. But in 1986 or ’87 the price for a hard disk came down to an “affordable” $2,000, and I and many Mac owners were tempted. In the mid-1980s, a 20-megabyte (MB) hard drive cost $2,000 ($4,000 in today’s dollars). That’s $200 per MB (in today’s dollars). Fast forward to 2018. On my way home last week I stopped by an office-supply store and paid $139 for a 4 terabyte (TB) hard drive. That’s $34 per TB. What would that 4 TB hard drive have cost me if prices had remained the same as in the 1980s? Well, one terabyte is equal to a million megabytes. So, that 4 TB drive contains 4 million MBs. At $200 per MB (the 1980s price) the hard drive I picked up from Staples would have cost me $800 million dollars—not much under a billion once I paid sales taxes. But it didn’t cost that: it was just $139. Hard disk storage capacity has become millions of times cheaper in just over a generation. Or, to put it another way, for the same money I can buy millions of times more storage. I can reprise these same cost reductions, focusing on computer memory rather than hard disk capacity. My 1979 Apple II had 16 kilobytes of memory. My recently purchased Lenovo laptop has 16 gigabytes—a million times more. Yet my new laptop cost a fraction of the inflation-adjusted prices of that Apple II. Computer memory is millions of times cheaper. The same is true of processing power—the amount of raw computation you can buy for a dollar. 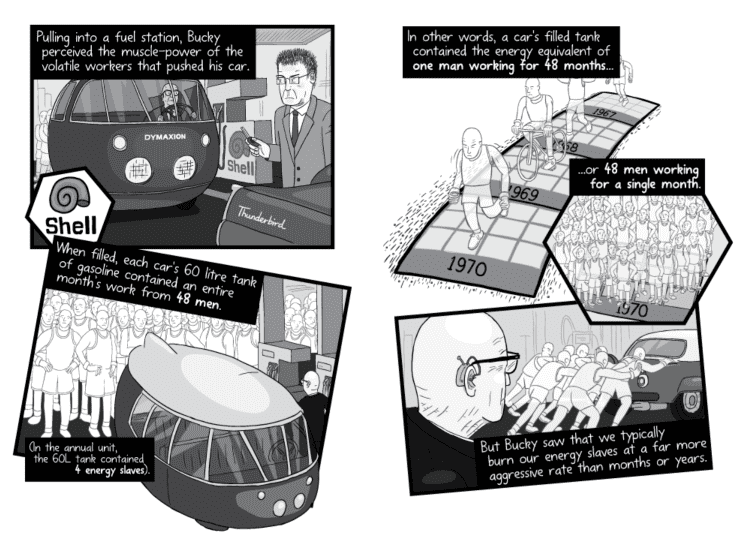 The preceding trends have been understood for half a century—the basis for Moore’s Law. Gordon Moore was a founder of Intel Corporation, one of the world’s leading computer processor and “chip” makers. In 1965, Moore published a paper in which he observed that the number of transistors in computer chips was doubling every two years, and he predicted that this doubling would go on for some years to come. (See this post for data on the astronomical rate of annual transistor production.) Related to Moore’s Law is the price-performance ratio of computers. Loosely stated, a given amount of money will buy twice as much computing power two or three years from now. The graph above illustrates Moore’s Law and shows the transistor count for many important computer central processing units (CPUs) over the past five decades. 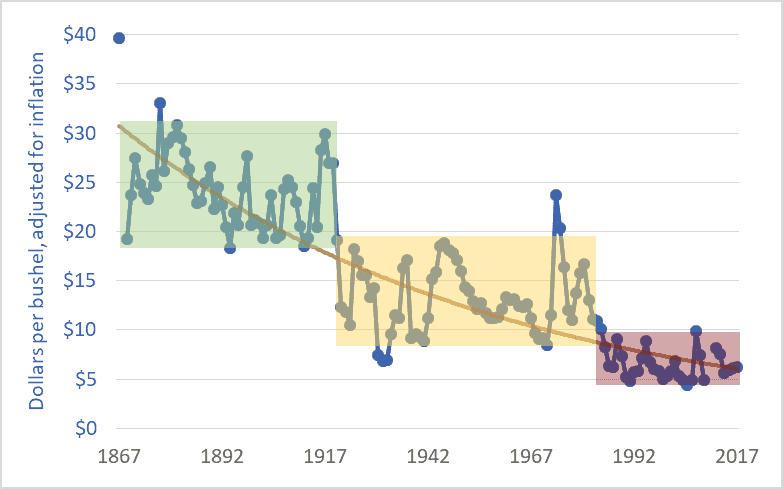 (Here’s a link to a high-resolution version of the graph.) 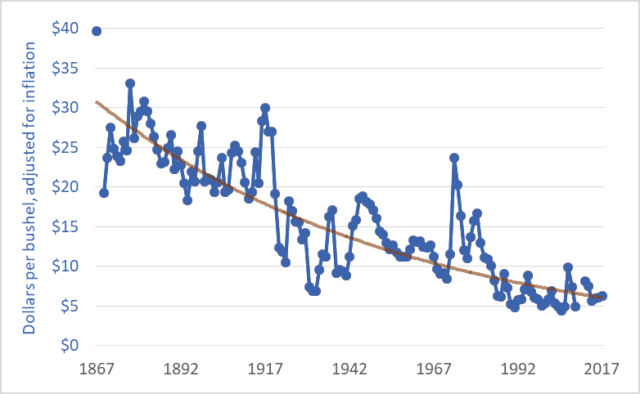 Note that the graph’s vertical axis is logarithmic; what appears as a doubling is actually a far larger increase. In the lower-left, the graph includes the CPU from my 1979 Apple II computer, the Motorola/MOS 6502. That CPU chip contained about 3,500 transistors. In the upper right, the graph includes the Intel i7 processor in my new laptop. That CPU contains about 2,000,000,000 transistors—roughly 500,000 times more than my Apple II. Assuming a doubling every 2 years, in the 39 years between 1979 (my Apple II) and 2018 (My Lenovo) we should have seen 19.5 doublings in the number of transistors—about a 700,000-fold increase. This number is close to the 500,000-fold increase calculated above by comparing the number of transistors in a 6502 chip to the number in an Intel i7 chip. 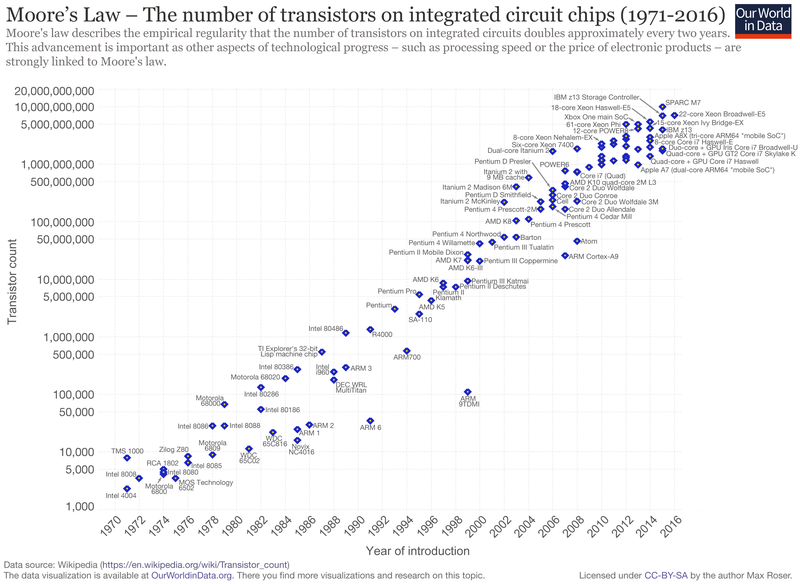 Moreover, computing power has increased even faster than the huge increases in transistor count would indicate. Computer chips cycle faster today, and they also sport sophisticated math co-processors and graphics chips. In terms of civilization and the future, the key questions include: can these computing-power increases continue? Can the computers of the 2050s be hundreds-of-thousands of times more powerful than those of today? Can we continue making transistors smaller and packing twice as many onto a chip every two years? Can Moore’s Law continue unabated? Probably not. Transistors can only be made so small. The rate of increase in computing power will slow. 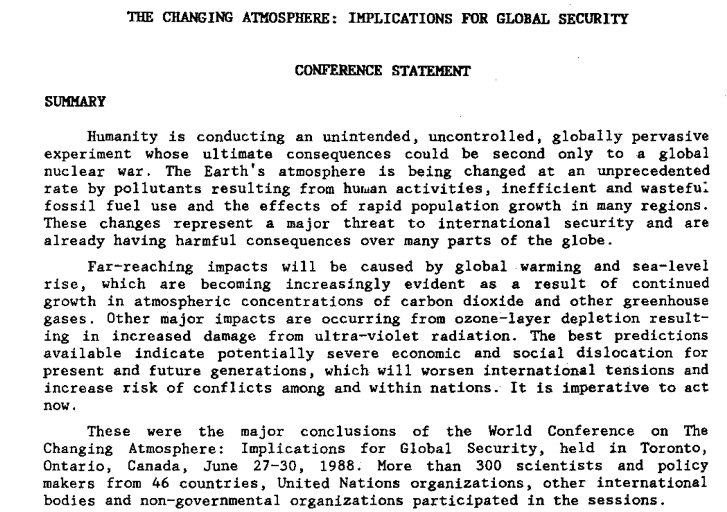 We won’t see a million-fold increase in the coming 40 years like we saw in the past 40. But does that matter? What if the rate of increase in computing power fell by half—to a doubling every four years instead of every two? That would mean that in 2050 our computers would still be 256 times more powerful than they are now. And in 2054 they would be 512 times more powerful. And in 2058, 1024 times more powerful. What would it mean to our civilization if each of us had access to a thousand times more computing power? One could easily add a last, pessimistic paragraph—noting the intersection between exponential increases in computing power, on the one hand, and climate change and resource limits, on the other. But for now, let’s leave unresolved the questions raised in the preceding paragraph. What is most important to understand is that technologies such as solar panels and massively powerful computers give us the option to move in a different direction. But we have to choose to make changes. And we have to act. Our technologies are immensely powerful, but our efforts to use those technologies to avert calamity are feeble. Our means are magnificent, but our chosen ends are ruinous. Too often we become distracted by the novelty and power of our tools and fail to hone our skills to use those tools to build livable futures. In just two years, 2013 to 2015, the number of electric cars worldwide more than doubled. And in the following two years, 2015 to 2017, the number more than doubled again, to just over 3 million. 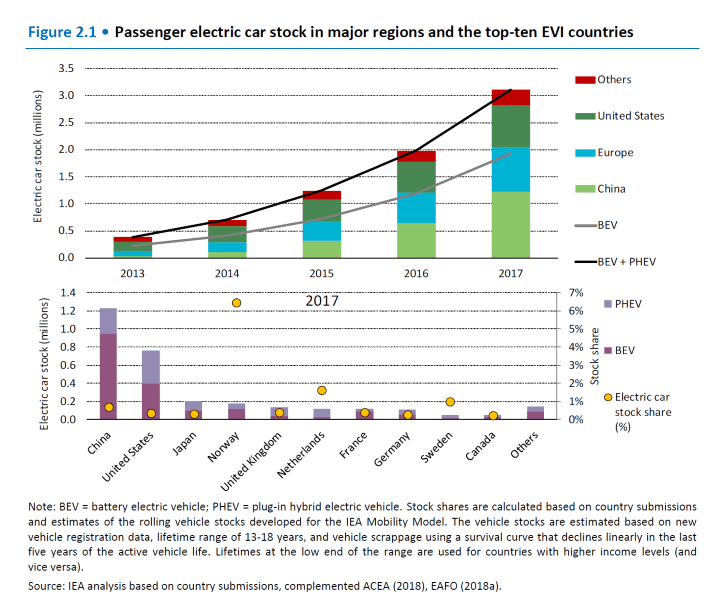 This exponential growth means that electric vehicles (EVs)* will soon make up a large portion of the global car fleet. This week’s graph is reprinted from Global EV Outlook 2018, the latest in a series of annual reports compiled by the International Energy Agency (IEA). 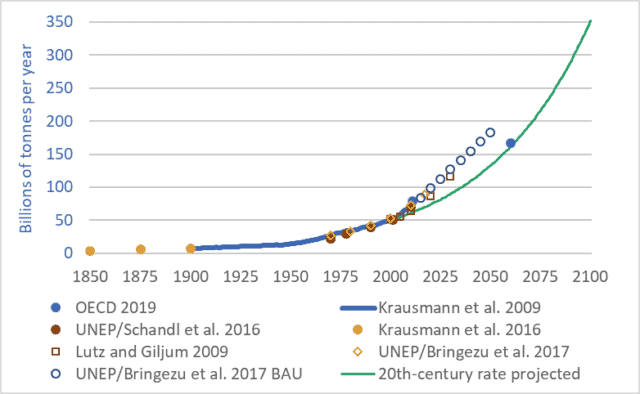 The graphs below show IEA projections of the number of EVs in the world by 2030 under two scenarios. The first, the “New Policies Scenario,” takes into account existing and announced national policies. Under this scenario, the number of EVs on the road is projected to reach 125 million by 2030. 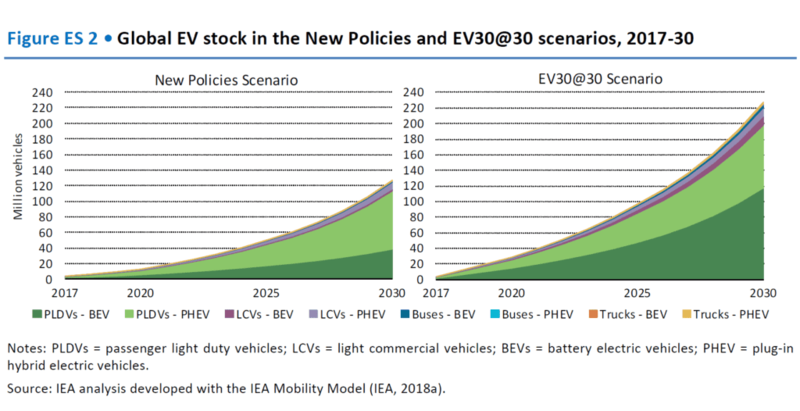 The second scenario is called “EV30@30.” This scenario is based on the assumption that governments will announce and implement new policies that will increase global EV penetration to 30 percent of new car sales by 2030—a 30 percent sales share. This 30 percent share is roughly what is needed to begin to meet emission-reduction commitments made in the lead-up to the 2015 Paris climate talks. Under this scenario, the number of EVs on the road could reach 228 million by 2030. In either case, whether there are 125 million EV’s on the road in twelve years or 228 million, the result will be an impressive one, given that there were fewer than a million just four years ago. In 2018, about 95 million passenger cars and commercial vehicles were sold worldwide. About 1 million were electric—about 1 percent. The goal is to get to 30 percent in 12 years. Attaining that goal, and thereby averting some of the worst effects of climate change, will require Herculean efforts by policymakers, regulators, international bodies, and automakers. * There are two main types of EVs. The first is plug-in hybrid electric vehicles (PHEVs). These cars have batteries, can be plugged in, and can be driven a limited distance (usually tens of kilometres) using electrical power only, after which a conventional piston engine engages to charge the batteries or assist in propulsion. Examples of PHEVs include the Chevrolet Volt and Toyota Prius Prime. The second type is the battery electric vehicle (BEV). BEVs have larger batteries, longer all-electric range (150 to 400 kms), and no internal combustion engines. Examples of BEVs include the Chevrolet Bolt, Nissan Leaf, and several models from Tesla. The term “electric vehicle” (EV) encompasses both PHEVs and BEVs. Some analysts and government officials characterize the period since 2007 as “better times” for farmers. But during that period (2007-2017, inclusive) total farm debt increased by $37 billion—rising by more than $3 billion per year. 1. Overall, farmers earned, on average, $47 billion per year in gross revenues from the markets (these are gross receipts from selling crops, livestock, vegetables, honey, maple syrup, and other products). 2. After paying expenses, on average, farmers were left with $1.6 billion per year in realized net farm income from the markets (excluding farm-support program payments). If that amount was divided equally among Canada’s 193,492 farms, each would get about $8,300. 3. To help make ends meet, Canadian taxpayers transferred to farmers $3.1 billion per year via farm-support-program payments. 4. On top of this, farmers borrowed $2.7 billion per year in additional debt. 5. Farm family members worked at off-farm jobs to earn most of the household income needed to support their families (for data see here and here). The Canadian farm sector has many strengths. By many measures, the sector is extremely successful and productive. Over the past generation, farmers have managed to nearly double the value of their output and triple the value of agri-food exports. Output per year, per farmer, and per acre are all up dramatically. And Canadian farmers lead the world in adopting high-tech production systems. The problem is not that our farms are backward, inefficient, or unproductive. Rather, the problems detailed above are the result of voracious wealth extraction by the dominant agribusiness transnationals and banks. 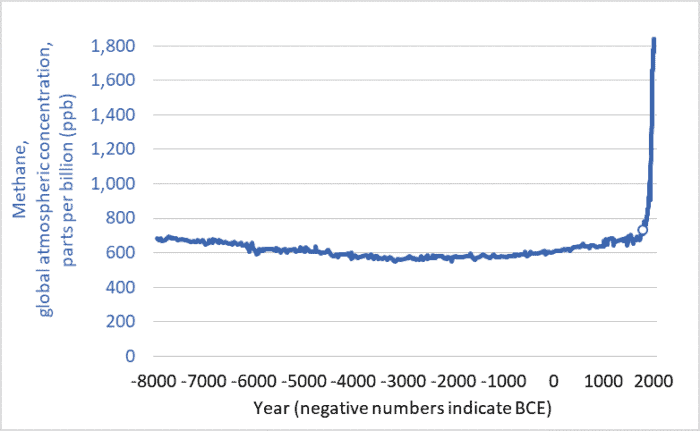 (To examine the extent of that wealth extraction, see my blog post here). 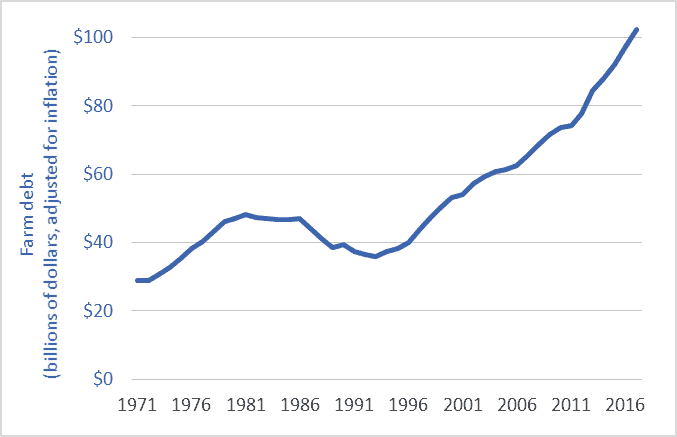 Although our farm sector has many strengths and is setting production records, the sector remains in a crisis that began in the mid-1980s. And what began as a farm income crisis has metastasized into a farm debt crisis. Further, the sector also faces a generational crisis (the number of farmers under the age of 35 has been cut by half since 2001) and a looming climate crisis. Policy makers must work with farmers to rapidly restructure and transform Canadian agriculture. A failure to do so will mean further costs to taxpayers, the destruction of the family farm, and irreparable damage to Canada’s food-production system.